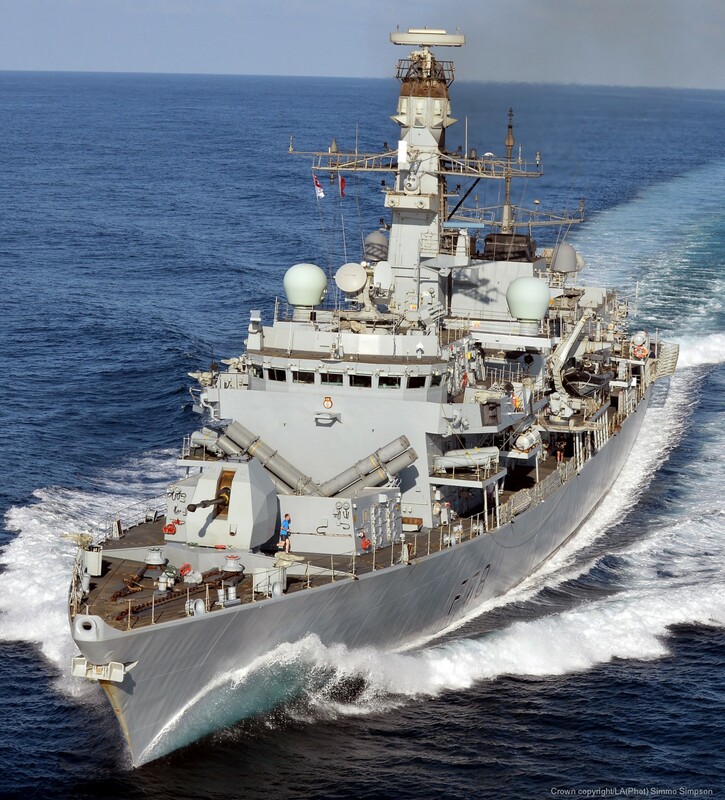 HMS Kent is a Type 23 Duke class frigate of the British Royal Navy, and the twelfth ship to bear the name, although technically she is named after the dukedom rather than the county. Sponsored by Princess Alexandra, The Hon Lady Ogilvy (daughter of the late Prince George, Duke of Kent), Kent was launched on 28 May 1998 and commissioned on 8 June 2000. 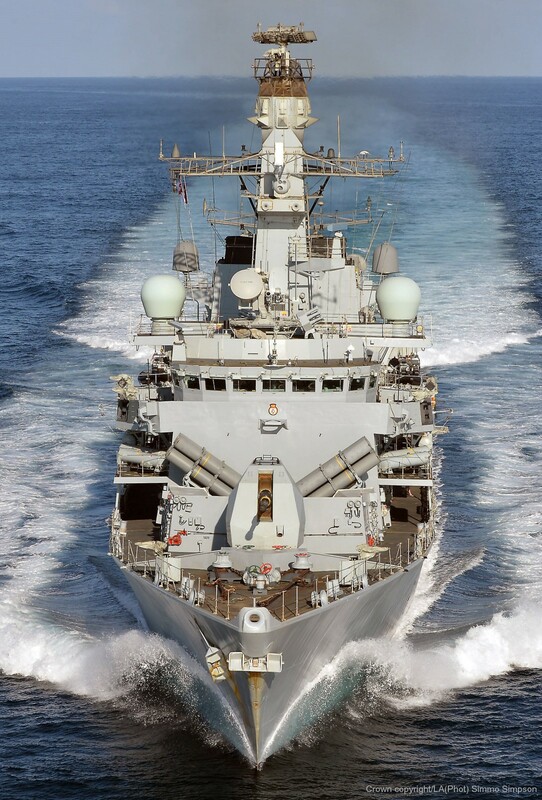 She was the first ship to enter Royal Navy service in the 21st Century. Kent's lineage boasts sixteen Battle Honours from the three given to the first Kent of 46 guns built in 1653, to the five awarded to the ninth and tenth Kents of World War I and World War II. March 2002 saw Kent return from the Persian Gulf after a five-month record-breaking mission under Commander John Clink. Kent seized more than £4 million of oil and illegal cargo: a record for the time. This mission also included the boarding of MV Ismael, a vessel which strayed in and out of Iranian waters to avoid capture - waters which Kent was forbidden to enter. 16 January 2006 saw Kent deploy on a 28-day training mission, under Commander Gavin Pritchard, to gunnery drills and firing off Gibraltar. This course was for the benefit of students on the Principal Warfare Officer course. This deployment included a two-day visit to Tunisia and a three-day visit to Barcelona. March 2006 saw the Football Association Chief Executive Brian Barwick visit Kent to show him around a modern Type 23 frigate. Mr Barwick was a guest at the RN vs. RAF football match at Havant, the tour around Kent was a pre-match treat for the FA chief. 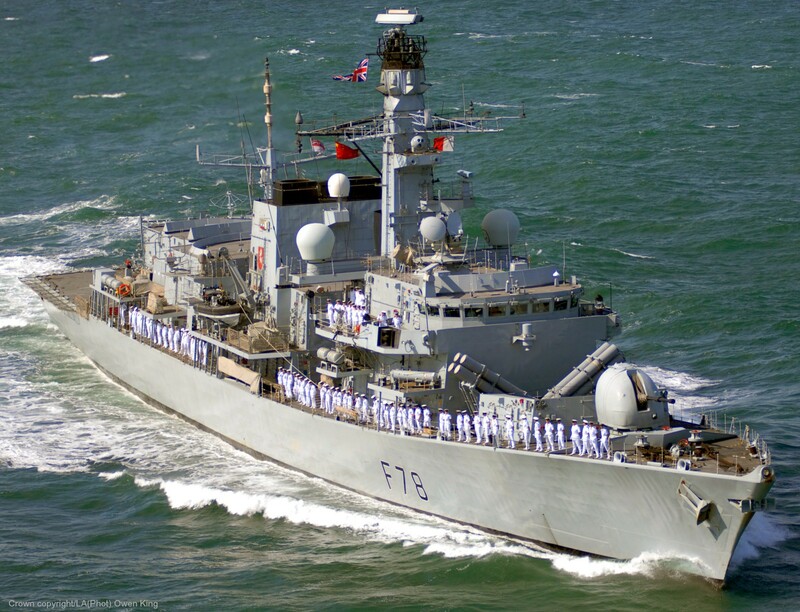 On 12 June 2006 Kent started a six-month deployment to Gibraltar, Malta and the Suez canal. Saturday 16 June saw the traditional Gibraltar Rock race, this time Leading Chef Paddy Crawford won the race in a time of 24 minutes. Games of 'Bucket ball' and tug-of-war were additional sports the crew engaged in. Kent then sailed to the Suez Canal, where the crew took part in the traditional race-against-the-ship with rowing machines, taking turns to see if the crew could 'beat' the ship to the end of the canal. Eighty-one crewmembers rowed 2 kilometres to make the attempt, winning the ship in a combined time of 162 kilometres (101 mi) in 10 hrs 34 mins. During a visit to Soudha Bay, Crete, the ruby anniversary of the meeting of John and Susan Hardwick aboard the previous Kent was celebrated in style aboard the latest ship to bear the name. Mr Hardwicke was a LSA(V) aboard the County-class predecessor to Kent when the then Miss Sittingbourne boarded. Ironically, the logistics officer on the ship at that time was Lieutenant Commander Mark Hardwick, son of the celebrating couple. 10 August 2006 saw crew from Kent visit the Abeer2 school, in Kuwait City. The school provides education, care and therapy for children with Autism. In true Royal Navy style, 'Jack' set to work with paint and hammers to decorate the school and mend a roof in 45 degree Celsius heat. Needless to say the crest of the ship was amongst the items painted on the wall. Kent was in the Northern Persian Gulf working 22-day patrols safeguarding the oil platforms and checking shipping in the area as per United Nations Security Council Regulations. Kent later conducted a self-maintenance period at Port Rashid, Dubai. After 60 days of patrols, 47 security sweeps of vessels approaching the oil platforms and 515 queries of merchant vessels, Kent left the Northern Persian Gulf and set sail home. A four-day visit to Muscat in Oman followed, which included training with the Omani Navy. A hockey game resulted in a pleasing 7-0 victory. In Mumbai, HRH Prince Andrew visited Kent. 15:00 hours, 5 November 2006 saw Kent hand over her duties to Sutherland in Salalah, Oman. Later on her way home, Kent made a goodwill visit to Beirut on Friday 17 November. The ship featured on national news and the crew visited some of the local sites. After Beirut, Kent visited Souda Bay and then the port of Civitavecchia, Italy. Algiers was the next stop, showcasing training to the Algerian Navy. A television conference and the chance to experience traditional Algerian food in the traditional style followed. February 2007 saw Kent awarded the Thales fleet active ASW award 2005/2006. Due to the busy period of deployments, the award ceremony had to be delayed until 2007. 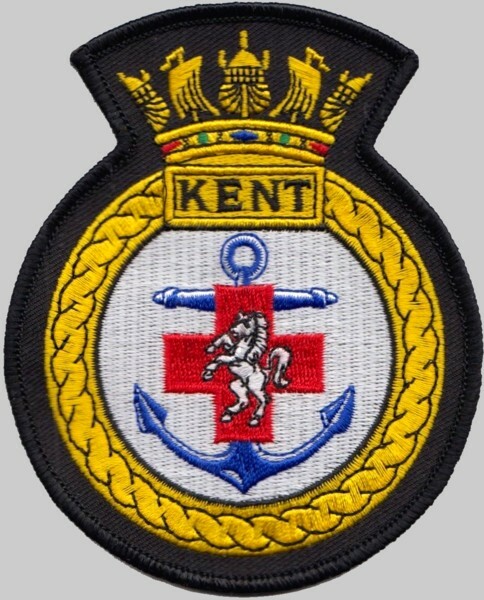 December 2007 saw Kent preparing for the customary Operational Sea Training period, training with aircraft and sea boat operations. With quieter evenings, quiz nights and sports television were the order of the day, along with 'Secret Santa' delivering inappropriate gifts for selected crew. January 2008 saw preparations for OST continuing afoot ready for the initial materials and safety audit. February 2008 saw the crew undertaking an ambitious changing of two of the four Paxman Valenta diesel engines. March 2008 saw an invitation from the Second Sea Lord to a Ladies Night aboard HMS Victory. Operational Sea Training sees the customary missions around the fictional port of Freeport, played by HMNB Devonport. This exercise involves political tensions and seeing how the crew responds to escalation in a proportional, measured manner. Later in the OST exercises in April, the crew of Kent dealt with a simulated earthquake aftermath in the fictional 'island' of Bull Point at Devonport. The 'Away Team' had to respond to the needs of the survivors in the same manner as they would in a real situation - dealing with injuries, restoring water and food supplies and providing safe shelter. May 2008 saw Kent off the Channel Islands providing a demonstration of the Royal Navy to the local islanders. This was also the first Jersey Boat Show with Kent the largest vessel on show. 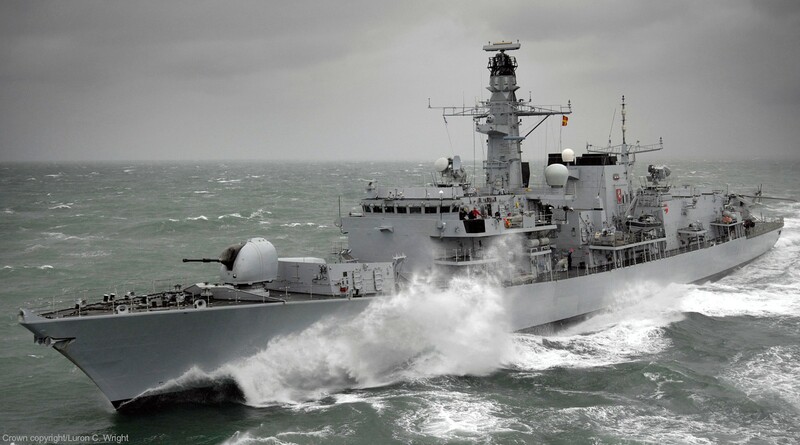 The following Thursday saw the culmination of Operational Sea Training. 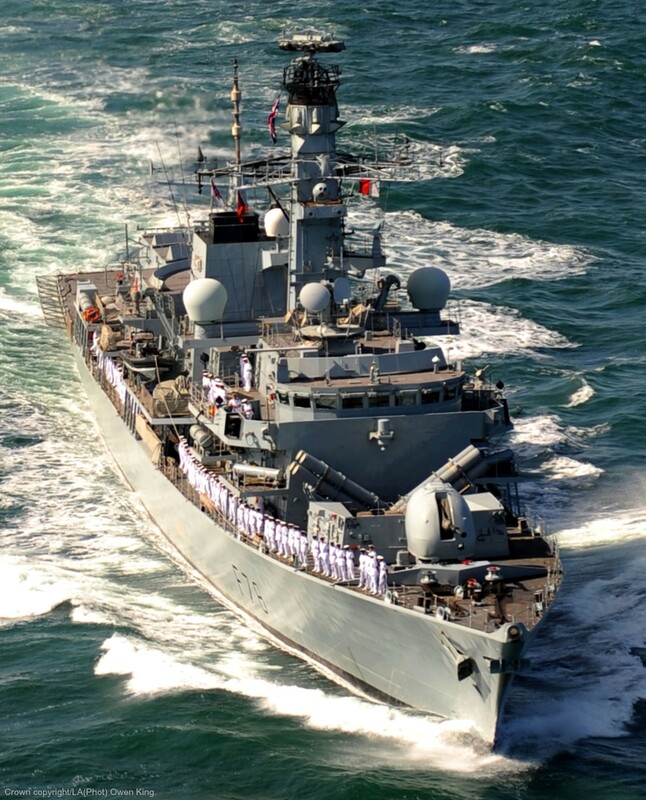 Saturday 31 May 2008 saw Kent get underway from 'The Wall' at Portsmouth for a six-month deployment to South Asia and the Far East. This voyage included visits to countries such as Russia, China, Japan and Indonesia, as well as participation in various multi-national exercises. A stop-off at Gibraltar saw the crews of Kent and Iron Duke race up the Rock in the traditional 'rock race', which is 3 miles (4.8 km) long and ascends 1,300 feet (400 m). Midshipman Cator was the winner with a time of under 24 minutes. In June 2010, Kent was sent on a mission to Sweden. The celebration of the official Queen's Birthday Party was held on board the British Warship in Gothenburg harbour, the first time that the event has been held outside Stockholm. After a stop at Hanö island where tribute was paid to the fifteen British sailors who rest there, Kent then continued to Stockholm to join the celebrations for the Wedding of Victoria, Crown Princess of Sweden, and Daniel Westling. In December 2010, Kent was withdrawn from the deployable fleet and entered overhaul. Her Commander, Nick Cooke-Priest moved to command Iron Duke, leaving second-in-command, Lieutenant Commander Alasdair Peppe in charge. Kent is now active as of 2013 and is currently being deployed around the globe after her upgrade a few years ago. In July 2013, Kent was deployed to the Horn of Africa on anti-priracy and anti-drug missions. 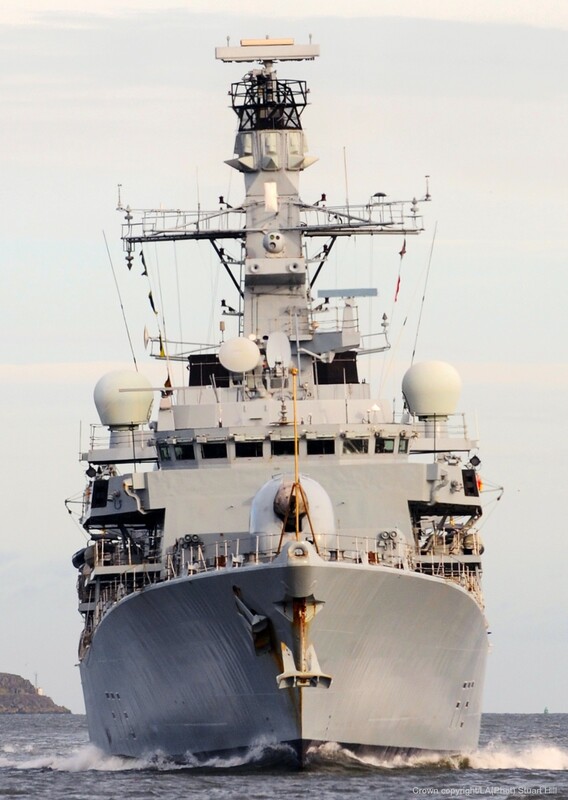 She worked with the Combined Maritime Forces and returned home in October 2013. In December 2014, Kent deployed to the Persian Gulf alongside USS Carl Vinson and other US Navy fleet units in the US Fifth Fleet's area of responsibility to help in efforts against smugglers, pirates, terrorists and also in the fight against the Islamic State of Iraq and the Levant. The title of Duke of Kent has been created several times in the peerages of Great Britain and the United Kingdom, most recently as a royal dukedom for the fourth son of King George V. Since 1942, the title has been held by Prince Edward. The Duke and Duchess of Kent currently live at Wren House in the grounds of Kensington Palace, but their office is based at York House at St. James's Palace.